Here's another image sent in by Alan Gornik from the book Directory to Apartments of the Better Class Along the North Side of Chicago, 1917.Click to enlarge view. The description reads: These medium-sized, high-grade apartments of six rooms, two baths, sun parlor, breakfast room, are excellent values at the rental schedule of $100 to $110 per month. 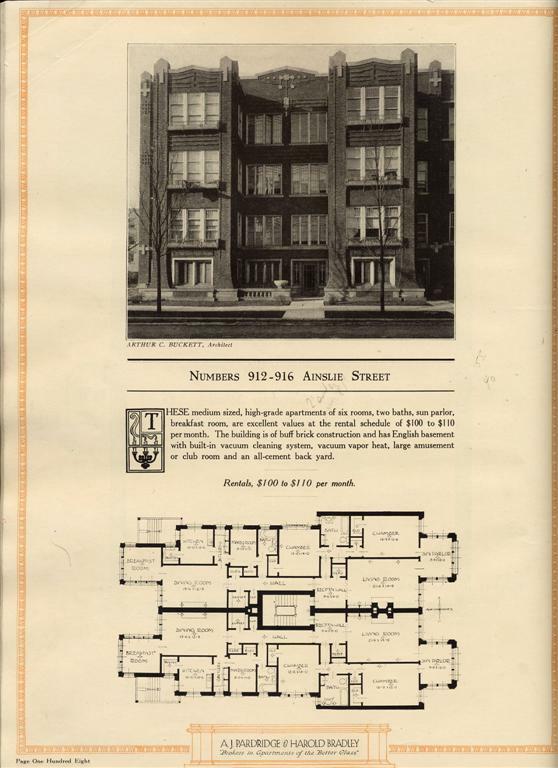 The building is of buff brick construction and has English basement with built-in vacuum cleaning system, vacuum vapor heat, large amusement or club room, and an all-cement back yard. WOW! This is my place!